An enhanced, high-protein flapjack bar to support muscle growth, strength and performance. Progain Flapjack Bars are the ideal, healthy, fast-food snack for hard-gainers and weight trainers needing extra calories to build muscle and size. Simply add one to two bars to your daily meal and training plan. Also contains probiotics to aid digestive and immune health. For complete confidence and reassurance to all drug tested athletes and sports people, Maximuscle has developed and pioneered a sports nutrition testing programme, with a UK accredited lab and it is ISO17025 certified and UKAS approved. For your peace of mind this involves testing each and every batch for problematic banned substances. Packed with over 22 grams of high quality protein, you get real muscle building punch from this delicious Flapjack bar. 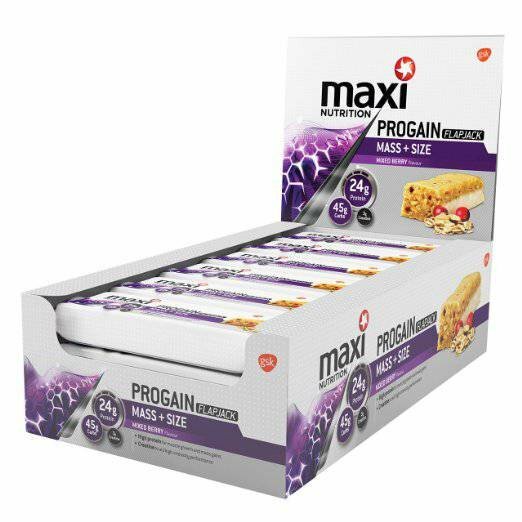 Why chose MaxiNutrition Progain Mass and Strength Flapjack Bar?